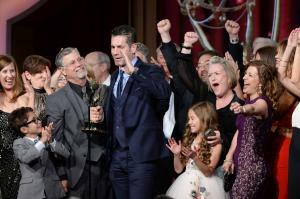 March 31 (UPI) — The ABC soap opera General Hospital marked its 55th anniversary with an installment producer Frank Valentini described in a tweet as a love letter to fans. The episode, which aired Friday, was set up as a black-tie party to remind Max Gail’s character Mike Corbin — who is suffering from dementia — about all of the people he has known and loved. “I’ve been thinking a lot about memory, how much it defines us. How much of our character is built from it. Our personalities, our loyalties, our souls, they are a response to what came before. We are the sum total of the connections we’ve made and the people we’ve lost,” Corbin’s adult son Sonny Corinthos, played by Maurice Benard, can be heard saying in voice-over at the top of the show. Appearing in the episode were actors and characters associated with the show for many years, including Leslie Charles’ Monica, Jackie Zeman’s Bobbie, Kin Shriner’s Scott, Kristina Wagner’s Felicia, John J. York’s Mac, Lynn Herring’s Lucy, Wally Kurth’s Ned, Jon Lindstrom’s Kevin, Steve Burton’s Jason, Nancy Lee Grahn’s Alexis, Finola Hughes’ Anna and Laura Wright’s Carly. The episode featured the long-time friends and, in some cases, frenemies reminiscing about their common experiences. Vintage clips from the beloved soap were interspersed throughout. Among the iconic, former denizens of the fictional town of Port Charles who appeared in the old footage were Tony Geary as Luke, David Lewis as Edward, Meg Wyllie as Lila, John Beradino as Steve, Rachel Ames as Audrey, Kimberly McCullough as Robin and Stuart Damon as Alan.